Heat oven to 325°F. Line 15x10x1-inch pan with cooking parchment paper. 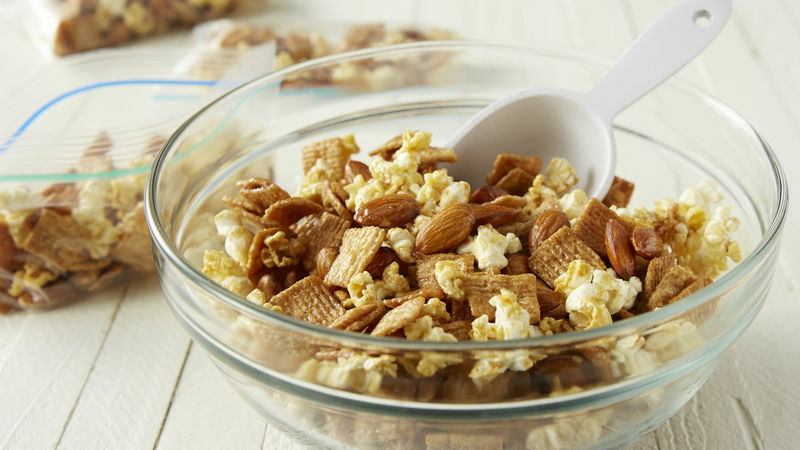 In large bowl, mix cereal, popcorn and almonds. In small bowl, mix melted butter and honey; pour over cereal mixture. Toss to coat well. Spread in pan. Bake 25 to 30 minutes or until mixture is starting to brown, stirring once halfway through bake time. Pour mixture onto waxed paper; cool 15 minutes. Break up; store in airtight container. Purchase already-popped popcorn in the snack section of your grocery store. Look for plain unsweetened popcorn. In place of whole almonds, you can use the same amount of mixed nuts or peanuts.